New year starts and new phone emerges. Ok, you know what I’m saying. Apple iPhone 5S is on the way, at least harangued blogs and leaked photos prove it. As an Apple zealot, getting this 4-inch seventh-generation iPhone for enjoying videos and movies on its full HD (1920×1080 pixels) Retina display seems to be the most intoxicating thing. But for DVD collectors, the experience of inability to play DVD on iPhone 5S is really an annoyance since the new iPhone, like its predecessors, is still devoid of DVD drive. As a result, to rip DVD to iPhone 5S accepted format first is a brook- no-delay task. Actually, this new iPhone 5S is said to support almost the same video and audio formats as the precious iPhone models. So if you want to play DVD movies on the new iPhone 5S, you can first seek for a DVD ripping software that is able to convert DVD to iPhone 5S compatible format like MP4, M4V or H.264. Luckily, MacX DVD Ripper Pro is the way to go. By making use of this Mac DVD to iPhone ripper, you can transfer DVD to a format that is optimized for the rumored new iPhone, regardless of copy protection encoded on DVD and then import DVD movie to iPhone, iPad, Android and more without any hassle. Below is the tutorial on how to rip DVD to iPhone 5S on Mac/PC computer. Best DVD ripper for iPhone 5s to rip any DVD movies to iPhone 5s/6/6 Plus/6S/6S Plus etc and remove any copy protections with 36x faster speed and original quality. After free downloading and installing this iPhone DVD ripper on Mac (El Capitan/macOS Sierra incl. ), or get the Windows (Windows 10 supported) version for PC users, import the DVD you want to convert by clicking “DVD Disc” button. You can also hit the “DVD Path” button to import DVD folder for converting. In order to backup DVD and rip DVD to iPhone 5S, there are two ways to fulfill the task. 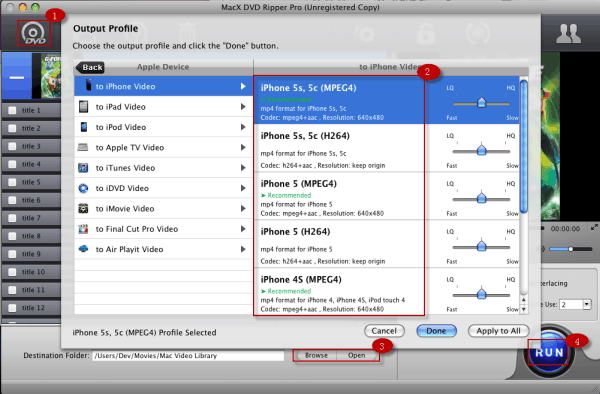 You can either move the mouse to the profile box and choose MP4 format from Mac General Video like the image above or simply hit Apple Device to directly choose to iPhone as the output format. Tips: this DVD ripper for Mac embraces more than 350+ output profiles to allow not only new movie releases on DVD to Apple iPhone 5S, but also to iPhone 6S/6s Plus/6/6 Plus, iPad Mini 4/Air 2/Pro, iPod Touch, but also Android, PSP, Xbox, and more. Besides, it also supports to rip DVD to MP4, MOV, FLV, AVI, MPEG, etc while delivering high quality ratio and fast converting speed. Finally, hit the bottom right “RUN” button to start DVD to iPhone conversion on Mac. The DVD converting would start in no time. After the conversion, you can import the converted DVD movie to the new gadget for unlimited playback with the sister software MacX MediaTrans. More information: you can reset video codec, bit rate, aspect ratio, frame rate, video size, audio codec, etc to keep the optimal video quality. Besides, the video editing function lets you crop the unwanted part and even help you watch DVD movie on iPhone 5S with full screen playback. By the way, for those who are running on Windows platform and wishing to rip DVD to iPhone 5S on PC, you can switch to MacX DVD Ripper Pro for Windows to do the job. Wanna play DVD movies on iPhone 5s on the go? Here you can find out how to rip DVD to iPhone 5s friendly video and then transfer DVD video to iPhone 5s for watching. Wanna rip DVD to iPhone 6s for free enjoyment? This guidance offers you the easiest solution to rip and convert DVD to iPhone 6s/6s Plus/7 with no loss of image quality.